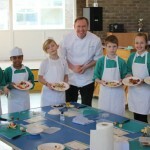 Following the success of last term’s International Chefs Day, this week our partner Professional Chefs from Nestlé gave children from two PhunkyFoods schools a taste of serving up delicious looking food and unique insights into why working as a chef is a career of choice. 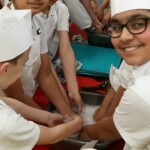 Approximately 60 students from Tyneview Primary School in Newcastle and Victoria Community Primary School in Burton upon Trent took part in the half-day sessions, which involved children in the cooking and presentation of meals, making it fun and interactive. This is a great way to ensure good eating habits are established early on. Encouraging children to be creative with food allows them to be adventurous and discover new foods they may otherwise avoid. The Nestlé Professional chefs also gave students unique insights into a day in the life of a chef and why being a chef is a career destination of choice. 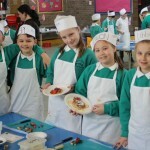 “A wonderful, extremely well organised morning of fun, humor & cookery. The children were engrossed by Darren and the team from the moment they walked in to the very last second, even the washing up was enjoyable.